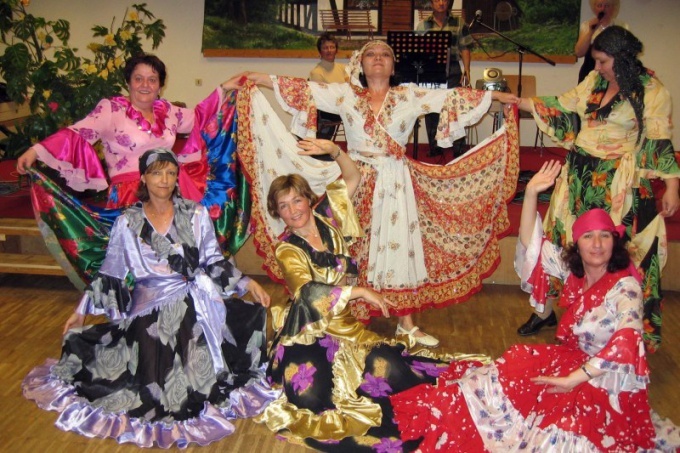 The costumes of the Gypsies will come in handy at corporate parties, children's party. The dress of nomadic people to sew is easy, as it is not tight, so you do not have a fit. Women's jewelry you do for a couple of minutes. Stitch women's Gypsy skirt without a pattern. Measure the circumference of your hips, multiply this value by 2 is the width of the skirt. This thing must be long. Measure the distance from the waist to the middle of the ankle, add 5 cm (2 undercut on the bottom, 3 for bending the top). Cut the canvas fabric on these dimensions. Sew the side seam, on hand hem the bottom of skirt. Will attrocity the top, turning down the fabric 3 inches on the underside. The edge of the fold again by 1 cm, the width of the lines equal to 2 cm. Leave 1 cm unsewn thread through the hole in the rubber. You can sew a skirt in another way. Fold the cloth four times. Measure your waist is arc length. For easy mathematical formula, determine the radius of the circle. The length of the arc, divide by 2 PI, in other words, 2x3,14, that is 6.28. Divide this figure in half, as there will be 2 panels. Put the beginning of the centimeter on the fabric corner. Hold it in this position. Second hand take a thin piece of chalk and inch, and attach them to where mark obtained the radius. Keep the chalk from one to the second side of the fabric, which are arranged on both sides of the angle. The line should be semicircular. On the same principle-cut hem Gypsy skirt. Measure the desired length, and the beginning of the cm has already put on just cut the line, she put down the desired length. Expand the blank of the skirt, make a lateral incision. Vykroyte exactly the same, add their sections to each other, the resulting 2 prostrochite side seam. Did you make the skirt double sun flared. Sew to the top belt and the bottom of process piping. Jacket women's Gypsy costume is sewn too easily. You can alter it unnecessary shirt. Sew it to the bottom of a long wide belt. It you can tie at the waist, if the sweater is long, trim it. Sleeve will do the same, shortening it to the elbow. This place sew the flounce or detail sun flare. The hip scarf to make a triangle. Sewn the edges, put a handkerchief over your skirt, tie on the left or right hip. For a Gypsy costume needs decoration. Suitable decorative coins or gold cardboard. Cut out its rings, string them on a thread, put a necklace on his neck. For the male Gypsy costume sew harem pants. Belt thread the elastic, just fill in the bottom. Make a shirt with wide sleeves, thread narrow elastic cuffs. For vest vykroyte piece of main and the same of lining fabric. Sew these products separately, then fold the vest lining and the main part right sides, sew them together. Leave a hole at the bottom, and through him turn the thing on the front side. It sew hidden seam. Fabric for skirt take it easy, it is a well draped. It is better if the color will be variegated. On the canvas can show off the flowers to be patterns, patterns.